Bernadette Levesque and Marta Chlus put on a clinic at the (very) belated and rain delayed start of the Saturday racing series this week, showing everyone else how to master he crazy conditions on the lake. Bernadette ruled the course, never coming in any worse than second, and except for a rough second race, Marta did the same, making a one-two punch that kept everyone else looking in from outside. 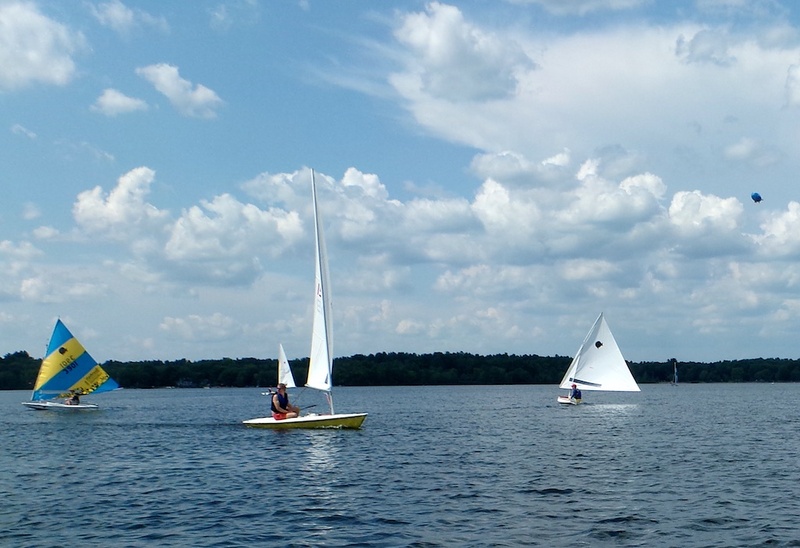 Conditions on the lake were light, heavy, and exceptionally shifty, forcing the Race Committee to set several potential windward marks. The wind didn't cooperate at all, frequently shifting outside all of them, and confounding matters by coming from different directions on different parts of the course. Huge leads were gained and lost several times during the course of each race, and a 10 boat length lead frequently meant nothing. A skipper who was first around the windward mark could, and frequently was, last around the windward mark, after the wind deserted them. Bernadette and Marta mastered the winds. Mark Stoughton came in 3rd in almost every race, sometimes losing by just inches. Scott Rosa joined the racing contingent this week, and did surprisingly well, with a third in his first race. Skip Russell took a 4th in the 1st race, beating Mark, who went right when the rest of the fleet went left. That's what happens sometimes in Sailing races. Hang in-- the wind may change.